The business is privately held and not publicly traded. The business is based locally and has no corporate or national headquarters outside the state. 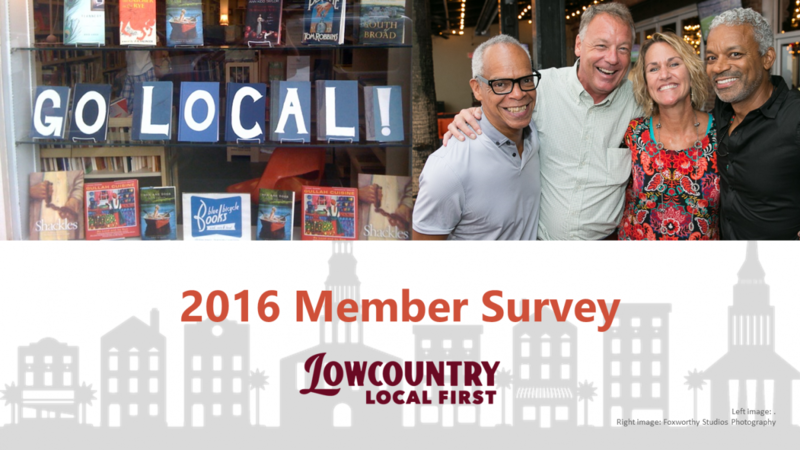 The business owners who have a controlling interest of more than 50% live in the Lowcountry. The business can make independent decisions regarding the name and look of the business, business purchasing, practices and distribution, as well as pays all their own marketing, rent, and other business expenses. Why does this matter? 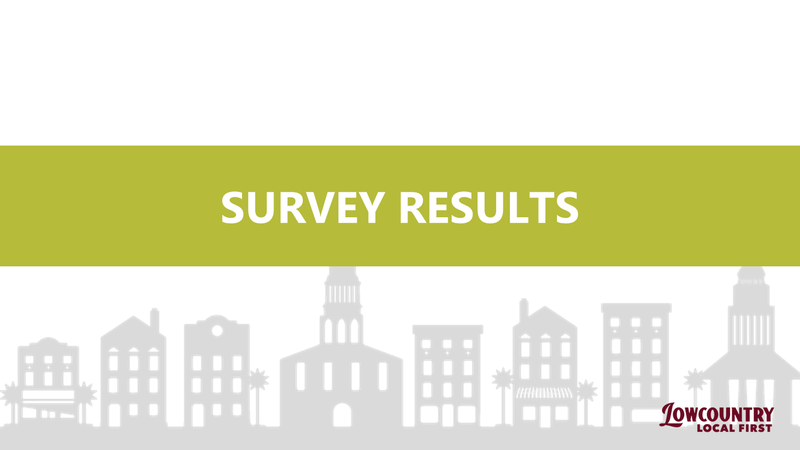 Well, local businesses reinvest 3 TIMES MORE money back into our local economy. 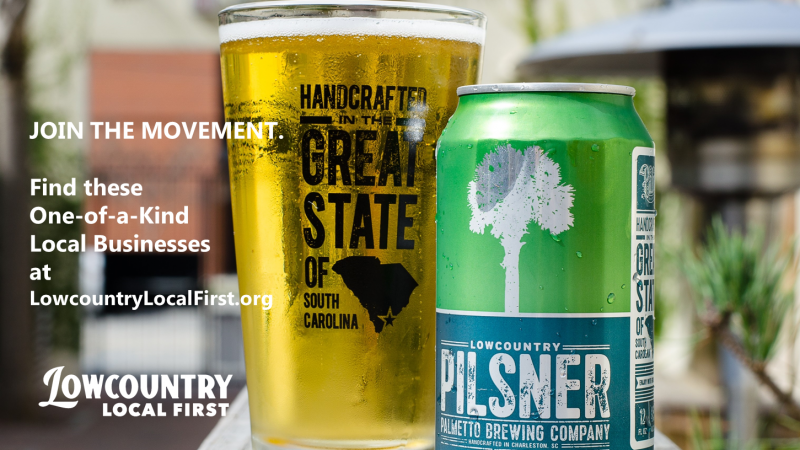 That means, for every $100 spent at a local business, an average of $45 is recirculated into the Lowcountry, vs. only $15 when that money is spent with a national chain store or corporation. 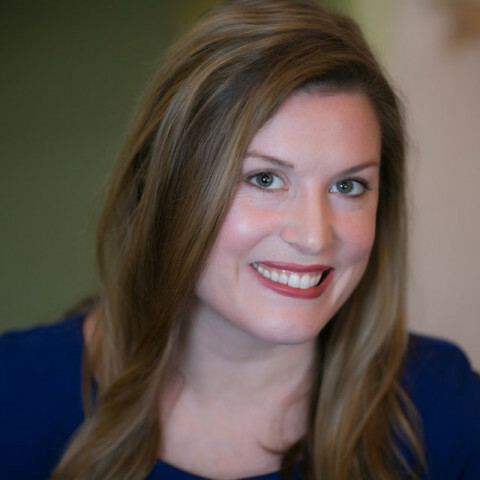 Local businesses are much more likely to hire a local marketing firm, use a local printer, and employ the services of a local attorney, creating a multiplier effect. 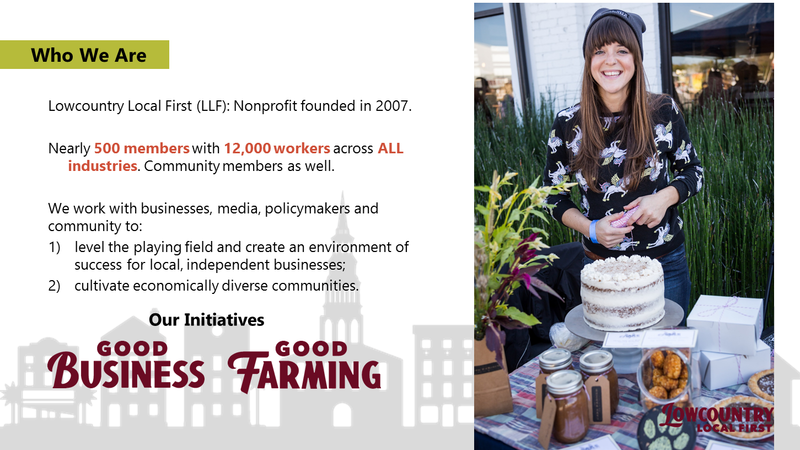 Size of Membership: The Lowcountry Local First membership base includes nearly 500 local-independent businesses from across a diverse array of industries and representing 12,000 workers, as well as 100 ‘Localists’ – community members who support the movement through membership. View our Local Business Directory to get a taste of these One-of-a-Kind businesses. 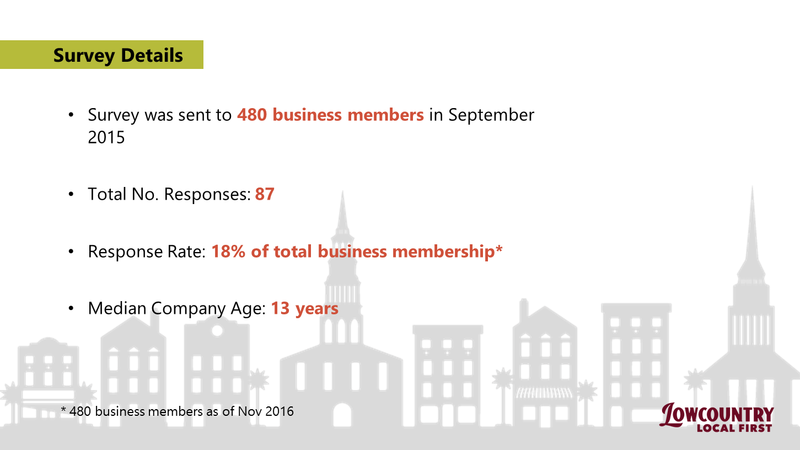 Age of Business: The median company age is 13 years old. 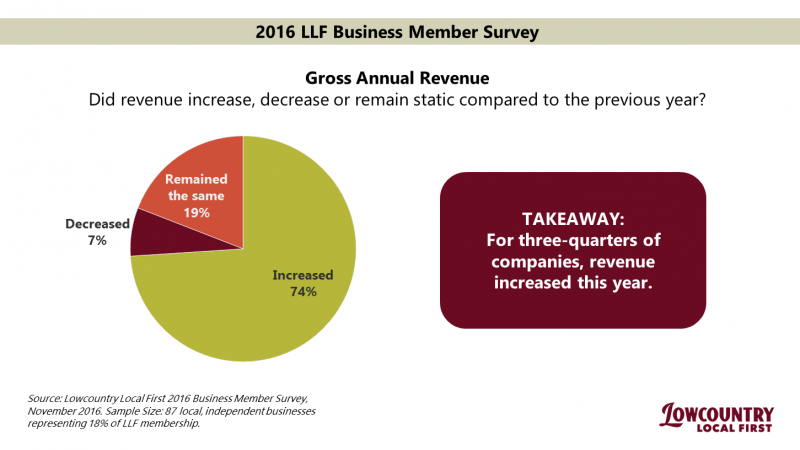 Gross Annual Revenue: For three-quarters of companies, revenue increased this year. 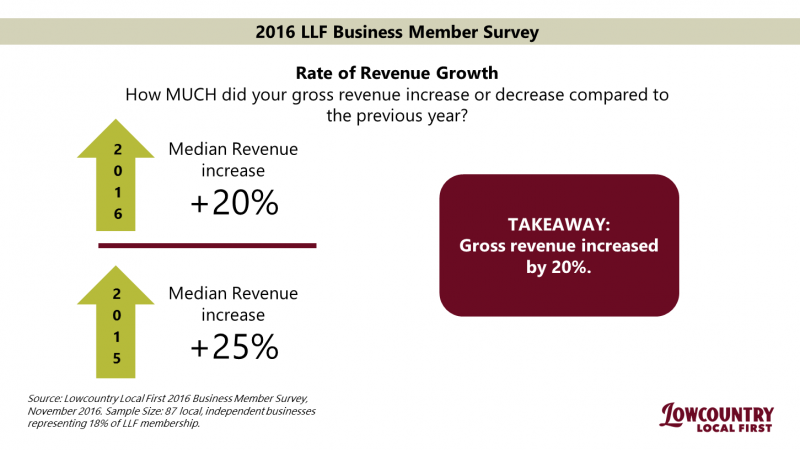 Rate of Revenue Growth: On average, gross revenue increased by 20%. 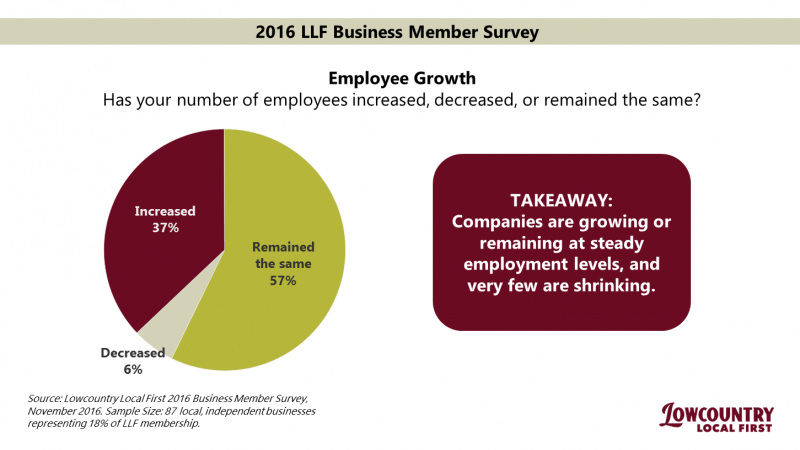 Employee Growth: Companies are growing or remaining at steady employment levels, and very few are shrinking. 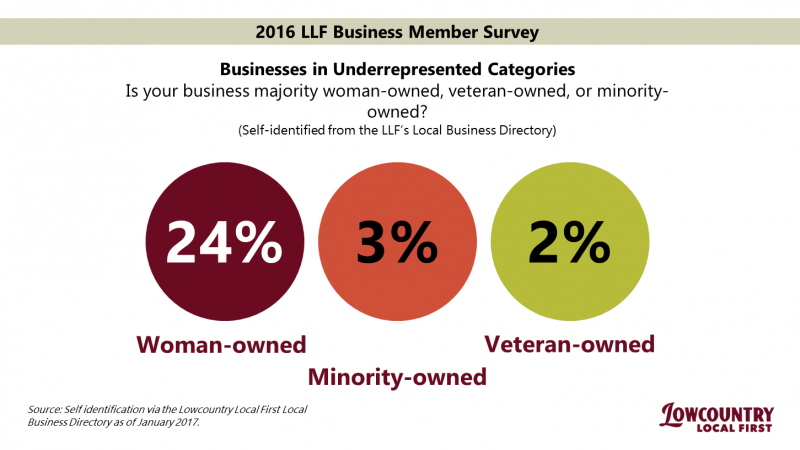 Businesses in Underrepresented Categories: Within our Local Business Directory, 29% of companies self-identified their business as majority woman-owned, minority-owned or veteran-owned. 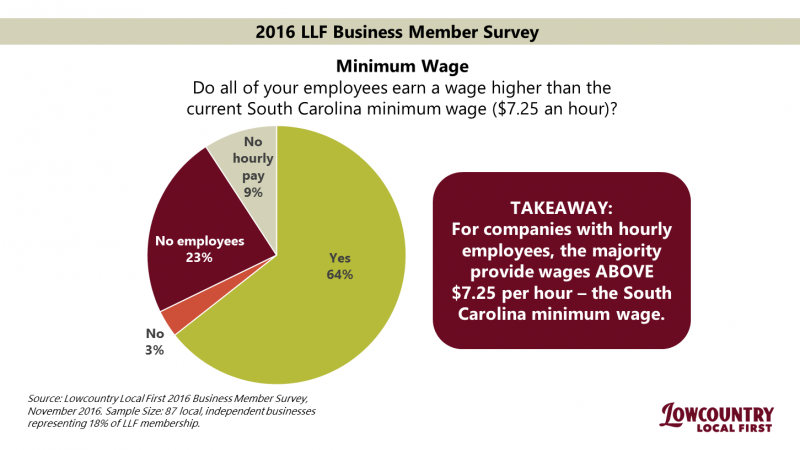 Minimum Wage: For companies with hourly employees, the majority provide wages ABOVE $7.25 per hour – the South Carolina minimum wage. 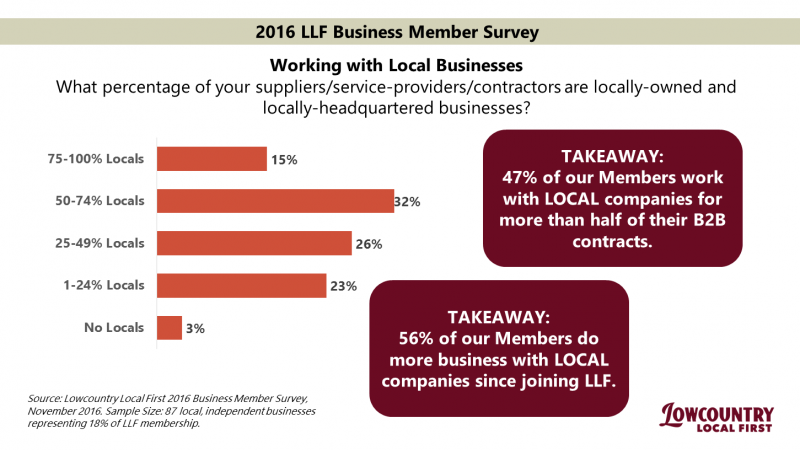 Working with Local Businesses: 47% of our Members work with LOCAL companies for more than half of their B2B contracts. 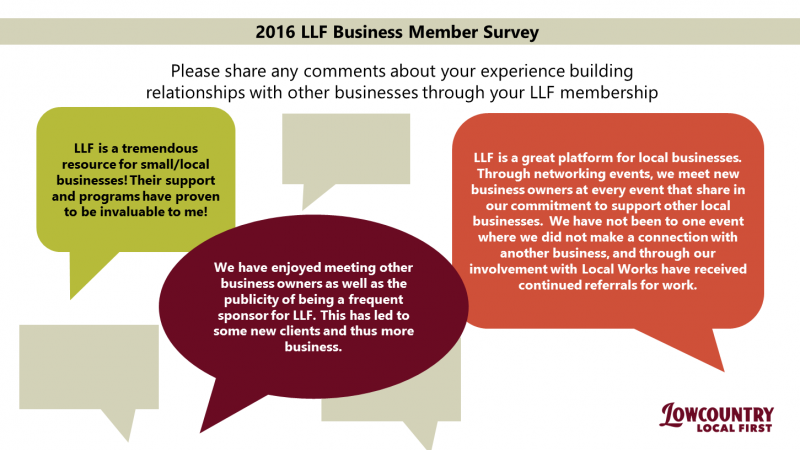 56% of our Members do more business with LOCAL companies since joining LLF. 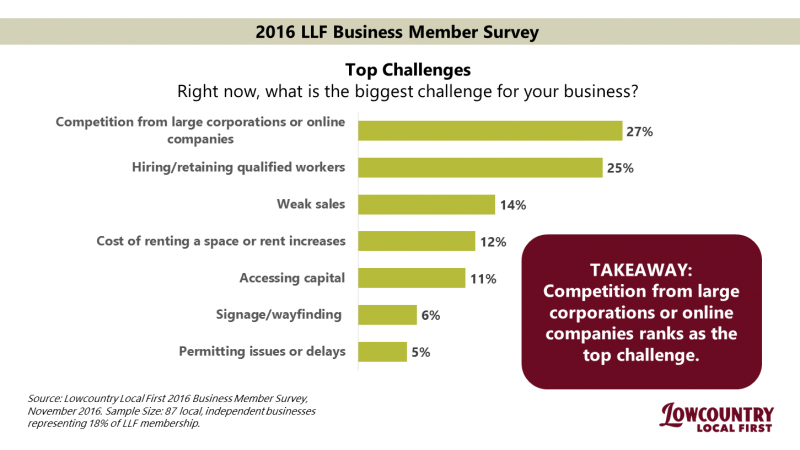 Top Challenges: Competition from large corporations or online companies ranks as the top challenge faced by our members. 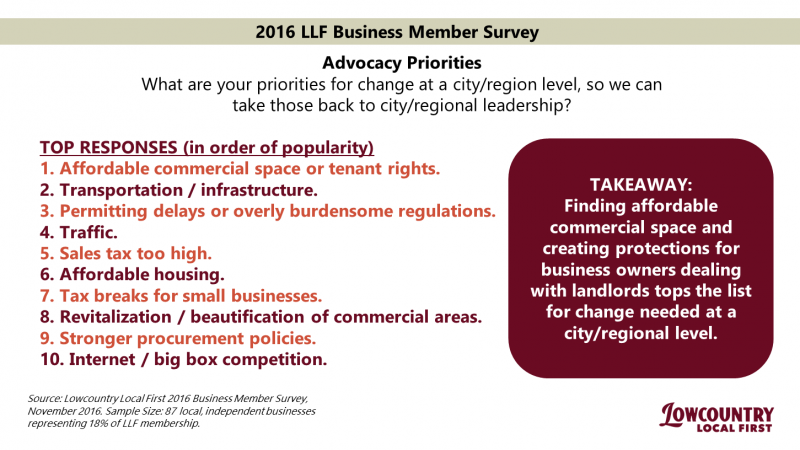 Advocacy Priorities: Finding affordable commercial space and creating protections for business owners dealing with landlords tops the list for change needed at a city/regional level. 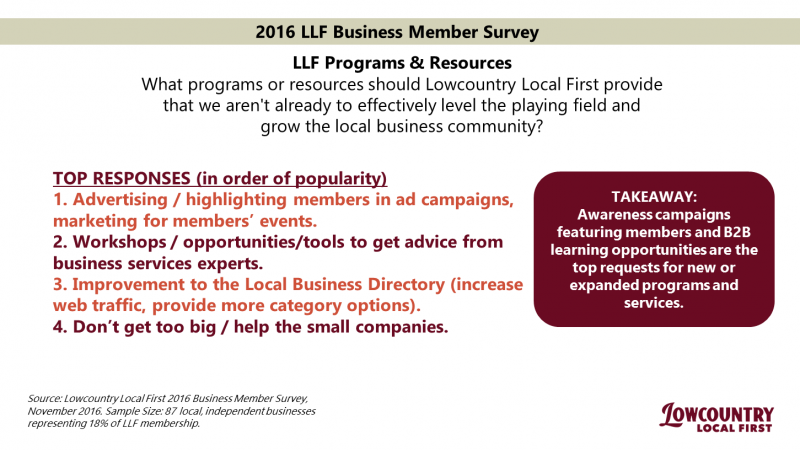 Programs and Resources: Awareness campaigns featuring members and B2B learning opportunities are the top requests for new or expanded programs and services. So, what are the huge letters all about?